Cassadee Pope EP Release Party!!! 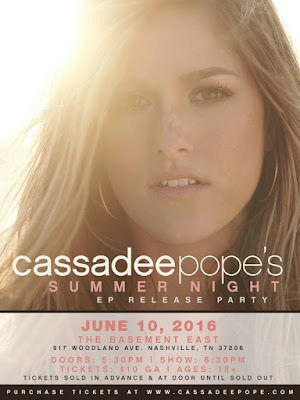 Cassadee Pope will be having an EP release party during the 2016 CMA Music Festival! The party will be held at The Basement East on Friday, June 10th at 6:30 PM! Tickets are just $10 and are available here! *Be advised that this venue is on Woodland St. about a mile east of the stadium so it's a long hike. Plan to uber, taxi, or carpool over!